How do you make the theme tune for one of the greatest movie villains sound less terrifying? Improvise on it and turn it into a stunning Beethoven-style piano sonata. Richard Grayson was a great American composer and pianist, who was a bit of a whizz at improvising. He used to give concerts like this one, in which he’d ask audience members for a famous theme, and a composer’s style that he could use to create a variation on the theme. In this clip, he improvises on Darth Vader’s theme (‘The Imperial March’) from John Williams’ soundtrack to Star Wars – and it sounds beautifully epic. 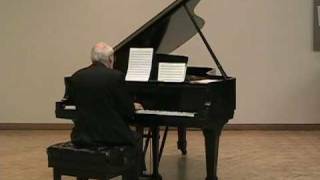 Richard Grayson passed away in July 2016 at the age of 75, having taught improvisation classes at the Showa Academy of Music in Japan for 10 years. He previously gave seminars for the Yamaha Music Education Foundation for over three decades.